I am changing the computer rankings formula on playoffPredictor.com to reflect margin of victory starting with 2018. This is big change to the core beliefs of the playoffPredictor.com model which have always been based on simplicity. To this point the model only considered wins and losses with no regard to margin of victory, away/home/neutral site for game, offensive or defensive stats, or month when game was played. A model that is this simple, this mathematical, and has excellent correlation to the final AP rankings year after year should not be tinkered with lightly. First, this change should make early season rankings more in line with human polls starting from about weeks 3-4. Currently since margin of victory does not matter the formula can not really distinguish between a 3-0 Baylor team and 3-0 Alabama team. It is only later in the season when there is more connectedness between Baylor’s and Alabama’s opponents or opponents opponents that the model can see Alabama’s wins to be superior to Baylor’s. Now, with margin of victory the model will be able to reward a 60-0 Alabama win vs an average Vanderbilt team earlier in the season. The 2nd goal deals with Auburn and the final 2017 committee prediction. After 3 very successful years of nailing the playoff committee rankings before they came out, last year was a bust for the playoffPredictor methodology when it came to Ohio State / Alabama and the final rankings. 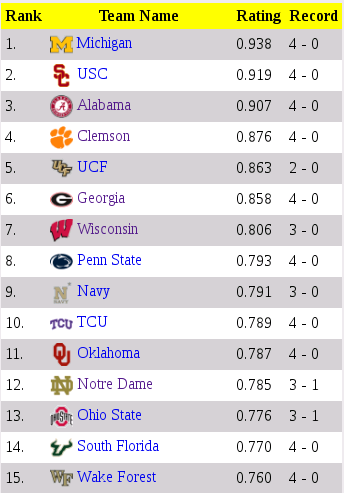 The model put Ohio State at #4 in the final rankings, when the playoff committee had them at #5. So what happened? A lot of it has to do with Auburn. Even after Auburn lost to Georgia in the SEC championship game, the computer did not punish Auburn much. Going into the game the computer had them at #11 and after the game the computer had them at #12. So they only dropped one spot in the eyes of the computer. But the humans dropped them from #2 pre-game to #7 post game. Because the formula uses this week’s computer rankings plus last week’s average bias, Auburn’s bias was so high (9 spots between computer at #11 and committee at #2) that when the computer only dropped them from #11 to #12, it expected the committee would similarly drop them from #2 to about #3 — what happened is that the computer was right before the committee saw it. Let’s take a closer look — here are the week 13 computer and human rankings for 2017. Week 13 is post Auburn-Alabama game (where Auburn beat Alabama) but pre SEC championship game. 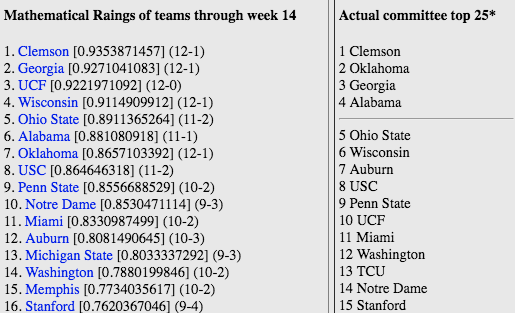 Note under the old formula (which does not take in margin of victory) Auburn is #11 in the computer. and #2 in the humans. 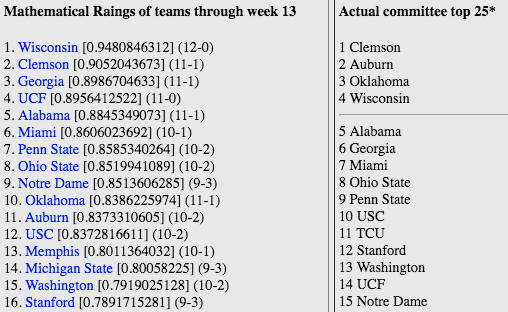 Now here are the week 14 computer and human rankings. Week 14 is post SEC championship game, where Georgia solidly beat Auburn by 21 points. 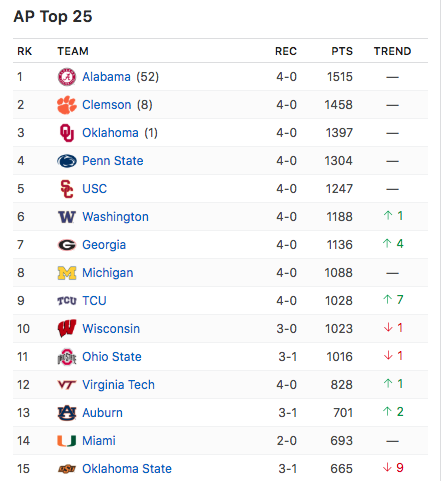 Again, under the old formula Auburn has moved from #11 only to #12 in the computer, and moved from #2 to #7 in the humans. 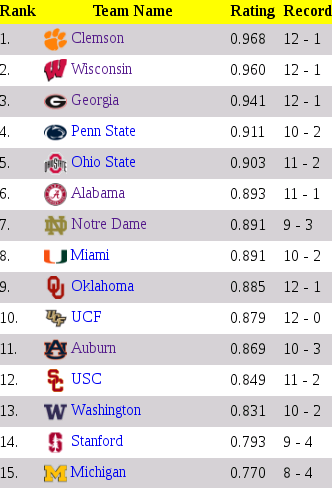 Clearly Auburn did not deserve to move from #11 in the computer to say #20 just because they lost to Georgia. Yes, they had 3 losses, but the losses were to Clemson (the #1 team in the final estimation of the committee), Georgia (played for the national championship) and LSU (average team), balanced with wins against Georgia and Alabama, who both played for the national championship. Clearly that is a team resume that should have been right where the computer said (around 10) and not around 20. So there is no fault in the computer here — it is the fault of the committee for not seeing what the computer saw earlier. Now let’s look at how 2017 would have played out if margin of victory was part of the computer formula all along. 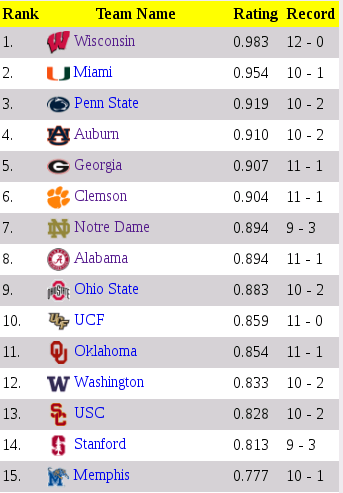 At week 13 Auburn is #4 in the computer. Of course they will still be #2 in the humans — so their bias will be a lot lower – only a 2 spot bias. At week 14 with the new formula, Auburn moves to #11 in the computer. That coupled with the more normal team bias would have put them squarely out of the final top 4 in the models calculus, accomplishing the stated goals. 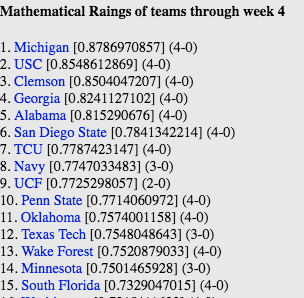 Note the details like Wisconsin is #7 in the new method, outside of the top 15 in the old. Alabama is at #3 instead of #5. Mathematically looking at the top 10 in all 3 lists, the average delta of old to AP is 5.0 and the average delta of new to AP is 4.1, indicating about a 25% improvement in computer to human by week 4. The correlation of the top 15 improves from .65 to .67.